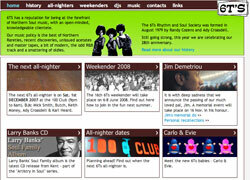 The 6Ts Allnighters are back at the 100 Club on a regular basis, with the nights running from 9pm until 6am in 2008, with membership no longer required. January 19th, March 8th, April 12th, May 17th, July 5th, August 16th, September 20th (29th anniversary night), October 25th and December 6th. And there’s one more allnighter for this year on December 1st, 9pm – 6am with Butch, Mick Smith, Keith Money, Ady Croasdell and special guest Karl Heard.